Living on the coast gives me easy access to my drug. I find them all over at yard sales, estate sales and of course at the beach. 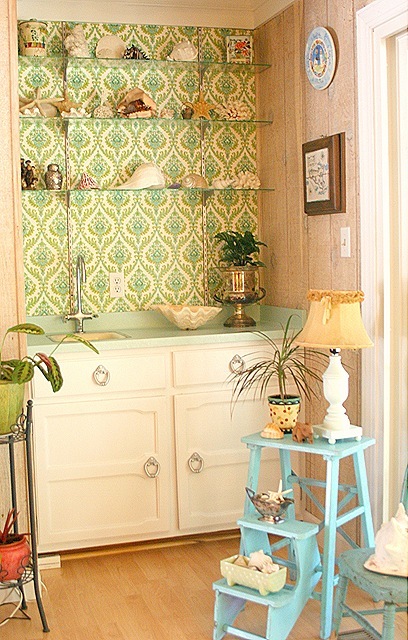 I recently inherited my MIL's beautiful seashell collection and I redecorated my wetbar to showcase it. If you scroll down just a couple of entries you will see the dramatic before/after pictures. Here is another "after" shot. Did you see the giant clamshell on the counter? I have two giant clamshells that are pretty big, this one being the biggest. That was UNTIL this morning's estate sale. This morning's estate sale was not too remarkable. An entire room full of Longaberger baskets. not. A bunch of Dept 56 christmas stuff. yuk. But upstairs I found this bohemoth. A full 18 inches across. That's my MIL's ruler from 1944. so sweet. Here is another picture with a can next to the shell so you can really get a sense of how big it is. It came with all the shells in it too! 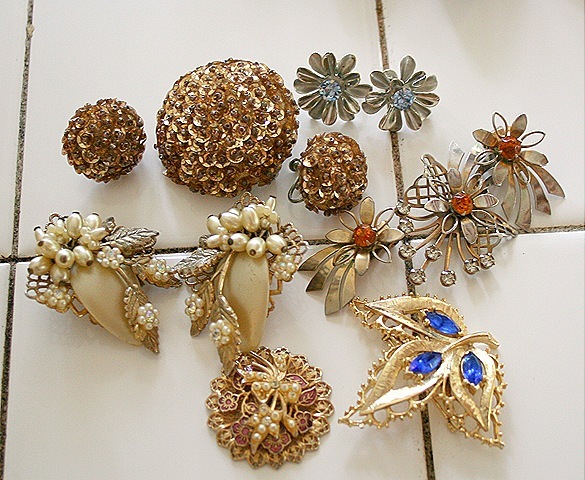 I also got a handful of vintage costume jewelry. Nothing at this sale was priced. Now I am quite aware of the value of that giant clam shell. I was really hoping these estate sale dudes did not. Did I mention that it is completely intact. 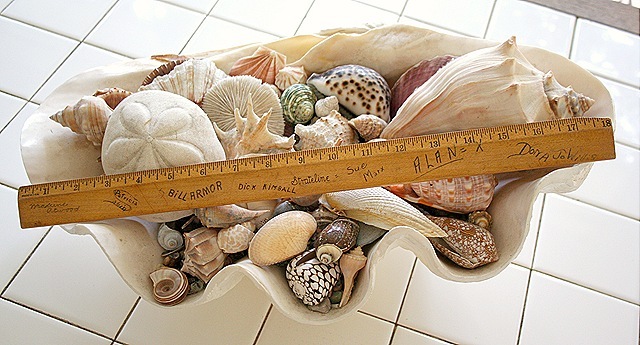 Frequently the bottoms of these large shells will be planed down to make them level. That's nice for display but it destroys their integrity. This one is perfect. When the dude in charge at the checkout said he would take $25 for everything I THREW my money at him and ran out the door. yippee! Huge shell!! HUGE What a great find. Wow! 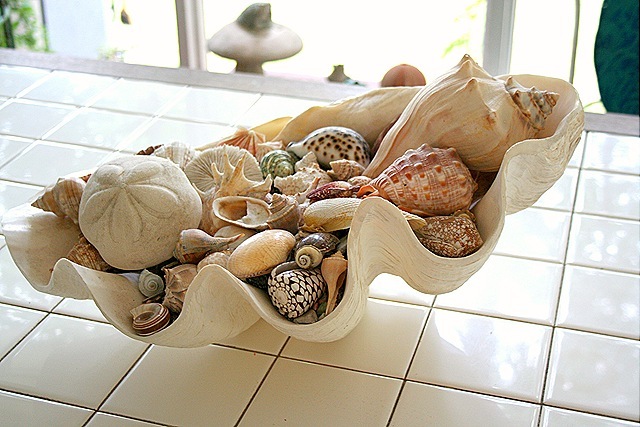 Now that’s a seashell. The kind you see in the movies where someone gets their foot caught in it’s jaws and the shell won’t open.., and a struggle ensues and finally someone comes to the rescue and …., oops, sorry. I got all carried away; been watching too many old movies. Can I please have the pearl earrings on the left in the jewelry photo? They are beautiful!!!!! I would have grabbed that beauty in a heartbeat, Suzy! I can’t believe it’s so gorgeous. I’m so glad you got it. That’s a great haul, Suzy. I went to an estate sale today, too. The lady was an avid doll collector, seamstress and all around collecter of stuff. Lots and lots and lots and lots of stuff! There was very little furniture in the small house, but tons and tons and tons of stuff. I got a vintage tin of buttons and some other smalls. Will debut them next week after I have had time to go through it. How weird is it that I am so very proud of you right now? I am just cracking up over your good fortune…that is one terrific shell! Will there be another jewel encrusted mirror in our future? 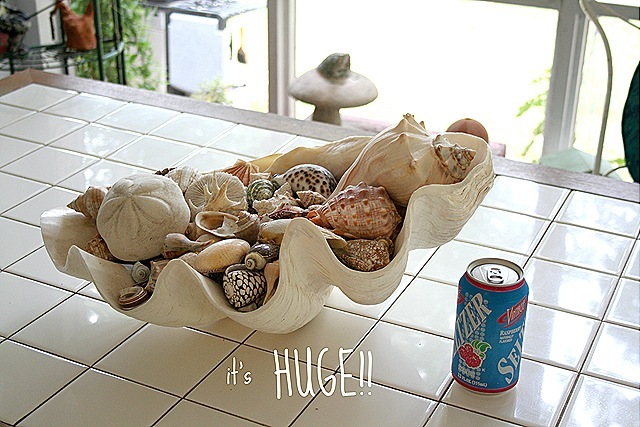 What a great find…I’ve never seen a giant clamshell in person!